The packaging is very sleek and feels a bit fancier than their usual product packaging, with squared glass bottles and mirror-shine caps. All the shades are also various types of iridescent shimmers and glitters. The price reflects these details, and the 9 mL polishes retail for CA$3.99 instead of the usual $2.99 for the 8 mL Gel Nail Polishes. 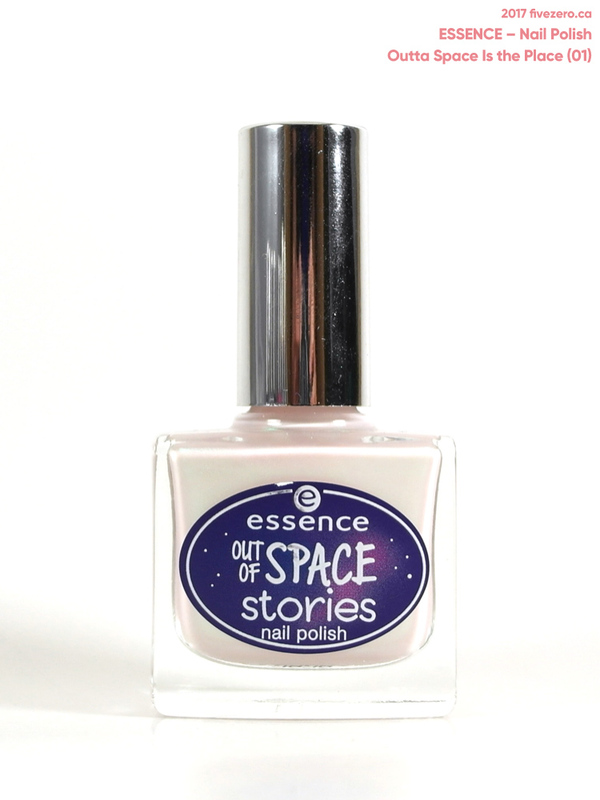 Today, I’m reviewing Outta Space Is the Place (01), a pearly iridescent white that is—very happily—opaque! Application is smooth and quite even, with two coats giving full coverage. I love the opalescent shimmer that flashes green and pink, and even though the finish does veer a bit frosty, I think I still really like it. 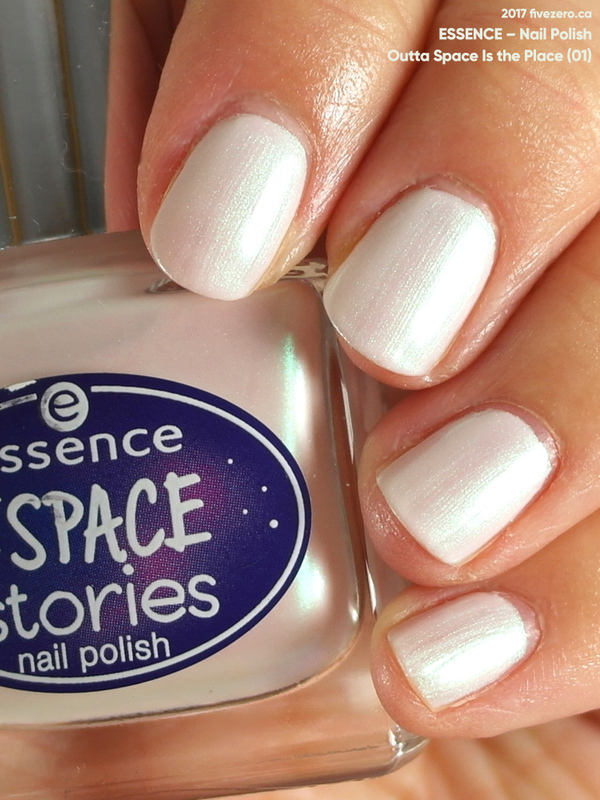 It’s the perfect snowball nail polish! Definitely check this one out if you like the look of it! 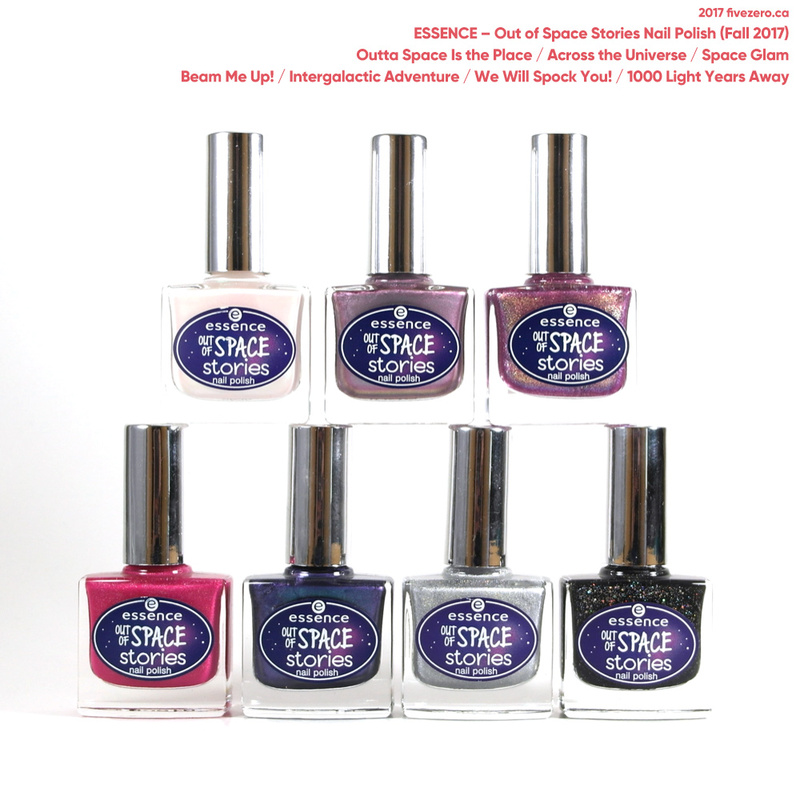 Essence Out of Space Stories Nail Polish contains 0.30 fl oz / 9 mL and retails for CA$9.99. It is made in Luxembourg. The product is free of toluene, formaldehyde, and dibutyl phthalate (DBP). The company is cruelty-free. Essence Cosmetics was launched in 2002 by Frankfurt, Germany-based cosnova Beauty, who also own cosmetic brands Catrice (2004) and L.O.V (2016). The company expanded to the USA in 2008, Canada in 2012, and is also available in many other countries worldwide. These polishes are so pretty! Love the color you used today. I’ve been eyeing the colour Space Glam – hard! Put it in my basket and then put it back on the shelf. This particular shade wasn’t on my radar but it looks really pretty and impressive that it is opaque. Ooh, pretty pretty. Such eye candy! I love these sorts of shades, but I never get them, because they never register in real life as they do in photos (one of those odd, in-reverse kind of things with nail polish!) Nice swatches, and I love the bottles.